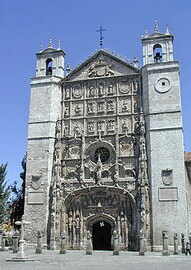 Valladolid - the capital of the province of Valladolid and of the autonomous community of Castilla y León. Some monuments include the unfinished cathedral, the church of Santa Maria la Antigua, the Plaza Mayor (the template for that of Madrid and of future plazas in the Spanish-speaking world), the National Sculpture Museum which includes Spain's greatest collections of polychrome wood sculptures, and the Faculty of Law of the University of Valladolid. 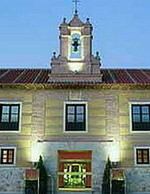 The AC Palacio de Santa Ana is a palatial 18th century monastery building set on the banks of the River Pisuerga, only 500 metres from Cervantes' house. The hotel has a lounge bar housed in the cloister, which boasts a large crystal-domed roof. Next to the monastery cloisters, with river views from its garden, the Los Jeronimos restaurant serves contemporary Castilian cuisine and a range of fine Spanish wines. Guests can take a dip in the hotel's indoor pool, enjoy a relaxing sauna or Turkish bath, and work out at the modern fitness room. It has 102 air-conditioned guestrooms over three floors, all decorated in light tones with minimalist-style furnishings and wooden flooring. The new-built Meliá Recoletos Boutique Hotel is situated in one of the most emblematic manor houses of the "Recoletos-Row", located in the historical city center of Valladolid - the heart of Castilla León, cradle of Kings and famous Spanish writers. The hotel offers an extensive breakfast buffet, a la carte Restaurant La Miranda de Recoletos, serving Mediterranean specialities and a fine wine list, covered patio/terrace of 700 m², multipurpose, just ideal for sitting outside until late and having a drink, bar inglés La Fontana. 76 Double rooms and 4 Junior Suites - including 15 charming loft rooms on the top floor, completely soundproofed and featuring a classical, warm and elegant decoration. The Novotel Valladolid is located in Valladolid, Spain, 50 metres from the Science Museum and 1.5 kilometres from the town's central square, train station, and Plaza Mayor. Situated in the business and commercial area of Valladolid, the Novotel Valladolid is a five-storey property designed in a contemporary style. 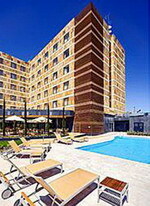 The hotel overlooks an outdoor swimming pool and sun terrace, and offers the use of a solarium during the summer months. The Claravia Restaurant serves lunch and dinner in a contemporary, minimalist setting. Bar del Autor serves drinks and snacks until 1 a.m. An onsite wine shop sells a selection of Spanish wines. The Novotel Valladolid offers a colourful games room for kids, complete with a slide, video games, and a play kitchen. The Hotel Silken Juan de Austria is a modern property with glass façade and panoramic lifts with views over the surrounding area; it is located 800 metres from the main square in the commercial and financial district of Valladolid. In the Juan de Austria Restaurant Mediterranean specialities and wines are served in a relaxed ambiance with warm colours and design furnishings. The Cafeteria Juan de Austria Spanish offers tapas and aperitifs served in an informal modern setting with a burgundy and gold decor. Air-conditioned guestrooms feature a modern decor with warm tones and dark wood furnishings. All 87 rooms have cable television, direct-dial phones, hair dryers and minibars. 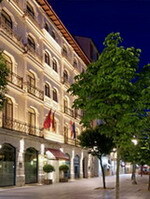 The Vincci Frontaura Hotel and Spa is located in Valladolid, Spain, 2.5 kilometres from the central square and city centre and within three kilometres of numerous churches and museums. 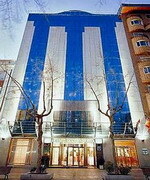 The hotel is three kilometres from Valladolid bus station. 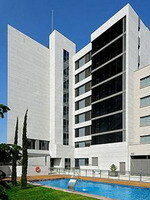 Housed in a contemporary building, the Vincci Frontaura has an air-conditioned lobby and coffee shop. There are indoor and outdoor pools and a poolside bar on site, along with spa services and a sauna. The 96 air-conditioned guestrooms extend to balconies and include satellite television, safes and minibars. The National Museum of Sculpture, three kilometres from the hotel, is housed in the beautiful Saint Gregory College, built in the Isabelline style. Tordesillas - a village in the Valladolid province of Spain. It was the site where the most famous Treaty of Tordesillas was concluded on 7 July, 1494 between Spain and Portugal that divided the globe between the two kingdoms for purposes of colonisation under the terra nullius-principle. The Main Square (see right) is also the main place in Tordesillas, in which the public activities have bean developed through the ages: markets, Middles Ages Games, bullfights, concerts, comedies, meetings. Many monuments and churches to be visited.. In the historic Castilian city of Tordesillas, a crossroads since Roman times, stands this mansion, in a green, natural landscape. 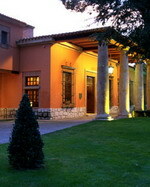 A lovely wood of pines and a large, well tended garden surround the hotel with the tranquil calm and serenity of nature. The Castilian style dominates both the exterior and the interiors, with valuable antique furniture in the lounges. The tranquillity of the hotel and the spectacular blue of the pool invite one to relax and take leisurely walks. Sit in the Parador’s dining room and enjoy its culinary specialities: garlic soup, Castilian style roasts, free-range chicken Turresillano style, and the local dessert, manjar de la Vega.